If you are deep in debt with no realistic way of paying the bills, bankruptcy could easily be the best way out. Today I received an Email from an attorney on the subject. More than a few of your posts counsel people to get the advice of an attorney before considering walking away from their upside down houses or filing bankruptcies. While I think that is wise counsel, I also think consumers need to have a resource to look to for such counsel. I suggest you post the website of the National Association of Consumer Bankruptcy Attorneys at www.nacba.org for resources and a listing of local bankruptcy attorneys. I am a member of NACBA and I find their resources absolutely critical to my practice and to counsel my clients. Thanks for your wonderful posts - I absolutely love reading them and being in the forefront so to speak, I enjoy seeing you dissect the frilly economists' false frills. I spoke briefly with Laxmi and she asked me to remind everyone that it was important to find an attorney in their own state because local and state laws differ. The above link can help. The NACBA site has links to some recent bankruptcy news including this article about bankruptcies in Georgia. Please consider the Atlanta Journal-Constitution article Georgia personal bankruptcies rate third-highest in the nation. Georgia’s crowded federal bankruptcy courts handled 66,925 filings during the first 11 months of the year, a 22 percent increase over the same period in 2008, according to statistics compiled by the National Bankruptcy Research Center. 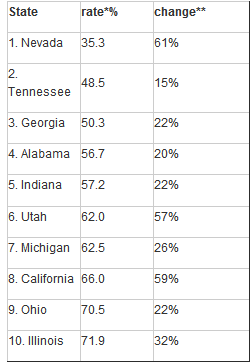 Only Nevada and Tennessee posted higher rates of personal bankruptcy, according to the center. Personal bankruptcy filings nationwide hit nearly 1.3 million between January and November, up 32 percent over last year. Richard Thomson, a partner at Clark & Washington, a high-volume Atlanta bankruptcy law firm, said early in the economic downturn his firm took on lots of realtors and contractors as clients. More than half of Georgians filing between January and November opted for Chapter 7 filings, according to the National Bankruptcy Research Center. A Chapter 13 filing, chosen by 47 percent, allows consumers to hold on to a house and car but requires that they repay a portion of their debts. That split is new in Georgia, which for years has been dominated by Chapter 13 cases rather than Chapter 7 filings. Holding onto a house and accumulated equity was the factor that pushed many debtors into Chapter 13 in the past. These days, many homeowners have little equity or owe more than their houses are worth. One in 35.3 Nevada households filed for bankruptcy in 2009. Wow! The above date from the AJC article and further credited to the National Bankruptcy Research Center www.nbkrc.com. The Email that kicked this post off was in response to Bankruptcy Filings - As Ye Sow So Shall Ye Reap. Two quick ways to dump debt are to walk away from no recourse mortgage loans and file for chapter 7 bankruptcy. The debt slave act of 2005, better known as the bankruptcy reform act of 2005 was supposed to prevent the latter but it is no surprise in this corner that it didn't. In fact, the law encouraged banks (and was purposely written to allow banks) to make high-risk loans thinking they could make debt slaves out of people forever. It is fitting the law backfired. As ye sow so shall ye reap. Neither housing prices nor wages will return to what they were. So even after people find jobs, lifestyles for all but a lucky few will not return to where they were. Salary cuts are going to necessitate permanent lifestyle changes. If you are unemployed, struggling, and deep in debt, it may be best to get it over with. If you manage to land a job first, you will struggle with the means test, forced repayments, credit rebuilding, and other issues on top of a reduced lifestyle. So if you are doomed to file anyway, try and do so when it will do you the most good. As always, please consult an attorney that knows the laws and procedures for your state. The same advice holds: Before Walking Away Consult An Attorney. There are a lot of potential snags to consider if you go it alone.